Wainwright's: Gowbarrow Fell (1579ft), Great Mell Fell (1762ft), Little Mell Fell (1657ft). I had planned a high walk today from Patterdale to St Sundays Crag and then along to Helvellyn, but alas the weather didn't comply. Spending the day in rain, clag & zero visibility didn't appeal so I decided that plan B was in order. I really want to get the eastern fells ticked off and the only remaining areas left unclimbed are the fells around Red Screes and then Gowbarrow Fell & the 2 Mells. I thought these latter 3 fells at least stood a chance of remaining below the cloud so I cobbled a vaguely circular route together and set off in the early hours of Friday morning. The obvious and most popular way to climb them is from Dockray or Matterdale End but I really want to climb all the Wainwrights from 'Lakes Level' and these starting points, being already at an altitude of over 900 feet would have meant climbing less than half the height of each fell. That just didn't seem right & proper and so I parked by Ullswater just to the south of Gowbarrow Fell to tackle them the long way round. My chosen path started along the popular waterfalls walk taking in the impressive Aria Force and High Force before I ventured off steeply right onto Gowbarrow Park. Gowbarrow Park is mainly a high plateau of grassy tussocks which, with all the recent rain, made for squelchy progress. A few craggy mounds rise above the plateau, the highest of which is Gowbarrow Fell summit which is easily identified by its trig point. Unfortunately the summit was just above the cloud level so views were very limited. I therefore headed northwards and dropped down to the road by Greenbank. The next target was Great Mell Fell and there being little other choice route wise, I trod the quiet roads towards this rounded fell which Wainwright describes as being like an "inverted pudding basin". A muddy path seems to wind its way around the lower perimeter of Great Mell Fell but with no obvious tangent routes up the summit (either on the map or the fell). I therefore took a pathless route sharply upwards through the forested lower flanks towards the higher ground. Signs suggested that this is red squirrel territory but they must have been hiding today. Eventually the trees dissipate and the summit is visible as a grassy plateau with a small cairn to mark the highest point. Low cloud still obscured the view but every now and then a gap would appear giving brief glimpses towards Great Dodd, Clough Head and the lower slopes of Blencathra. This seemed like a good spot for lunch but despite the 30 minute break, views remained limited so I headed back down eastwards eventually joining the same muddy perimeter path. No squirrels seen but I managed to surprise 3 deer which bolted off at an impressive pace. 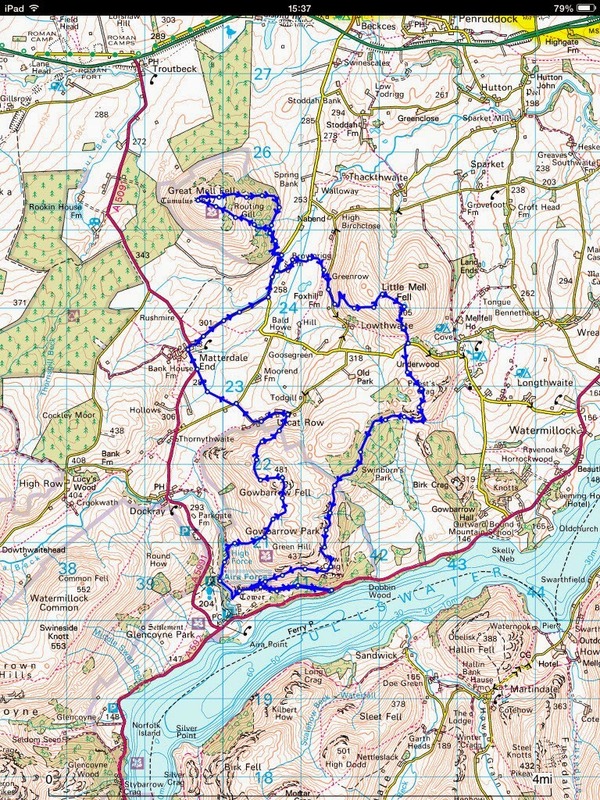 The route ahead went through Brownrigg farm, across very boggy fields & a small beck before zigzagging its way onto Little Mell Fell whose grassy summit is adorned with a trig point. By this time the cloud had lifted and I enjoyed clear views towards Gowbarrow Fell, Great Mell Fell and glimpses of Ullswater. At this point the rain, which had been intermittently drizzly so far, became more heavy and persistent. I battened down the hatches and descended south before crossing the road onto a path which eventually joined the forest track through Swinburn's Park. Beyond these densely forested conifers the track emerges onto a craggy path which looks down steeply onto Ullswater and the high fells beyond. The views here were magnificent and at one point in particular, a spot called Memorial Seat, nearly the whole length of Ullswater is in view. From this point I had intended to descend the steep path to Yew Crag but the rain was getting heavier and the path looked in poor condition so I opted for the more cautious route which continued westwards on a gradual descent back down to Ullswater. By the time I got back to car it was nearly dark. This walk had taken far longer than expected. Another 30 mins and I would have been delving the lower crevices of the rucksack for the head torch. So that 118 Wainwrights completed and just 11 eastern fells left which are next on the radar. 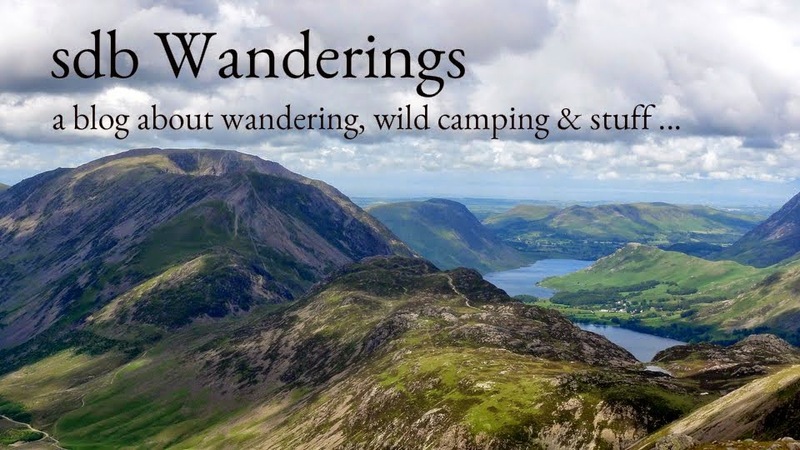 These being; Arnison Crag, Birks, Catstye Cam, Birkhouse Moor, Sheffield Pike & Glenridding Dodd (one long walk or a 2 day wild camp); High Hartsop Dodd, Little Hart Crag, Middle Dodd & Red Screes (a day walk from Ambleside or Hartsop); and Steel Knotts which is the awkward outlier.